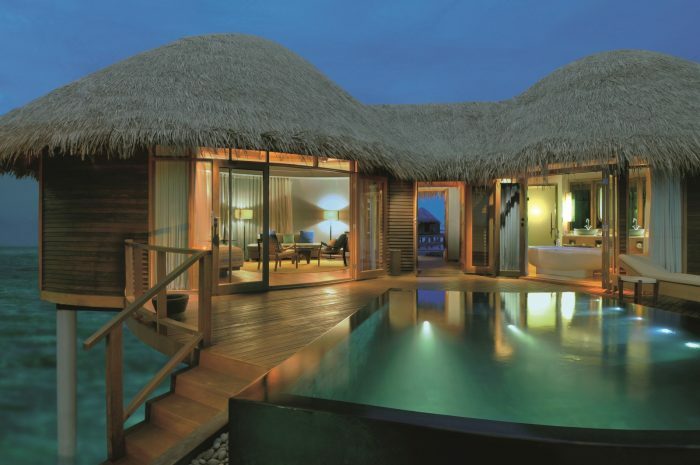 Honeymoon Offer – Stay at Constance Halaveli for your honeymoon and save up to 40% off Villa rates. Please contact us for further details. Constance Halaveli Maldives is a floating paradise in the Indian Ocean. Azure skies perfectly blend with turquoise waters and powdery white sands to create heaven on earth. Abundant in natural beauty and lush greens, magical moments are created at Constance Halaveli and this luxury resort is effortlessly tranquil and exotic. Boasting only 86 contemporarily styled villas, the experience is one of exclusivity and magnificence. Each villa is flourished with a private plunge pool, located over water or on the beach and a furnished balcony or terrace. Designed to provide undisturbed views of the Indian Ocean, the spacious villas are comfortable and luxurious. Marble and modern wood grace each villa generously, subtly displaying beauty and becoming a restful haven. With three dining options, the choice of cuisine is fantastic. Perfectly plated dishes are delightful and guests can watch the charming Maldivian sun set afar, as they tuck into dinner. U Spa is a wonderfully peaceful sanctuary, enticing guests to experience wellbeing treatments in this exotic paradise. Honeymoon Offer – Stay at Constance Halaveli for your honeymoon or wedding anniversary and save up to 40% off Villa rates. Honeymoon Offer – Stay at Constance Halaveli for your honeymoon or wedding anniversary and enjoy up to $100 resort credit per night. Majestically set on stilts in the Indian Ocean, U Spa is a holistic haven that encourages health and well-being. Spa treatments rooms that look out onto the ocean, guests drift away to the calming sound of ocean waves gently crashing. Guests are stunned by the natural elements of the Indian Ocean plants, reformed to create aromatic products for spa use. 10 serene treatment rooms, sauna, steam room and hot and cold plunge pools are just some of the relaxing amenities to be enjoyed at U Spa. The Ocean Salon offers hairdressing and styling, manicures and pedicures, spoil yourself with pampered luxury. Fully equipped gymnasium, including free weights and state of the art machines. Aariyaa Speed Boat – The luxury of your Constance Halaveli Maldives starts from your arrival at the airport. The Aariyaa speed boat transports you to this splendid hotel in luxury style. For the younger Constance guests the Kids Club is ready and waiting for kids to partake in lively and energetic activities. Fun and entertaining activities include: – arts and crafts, themed days and computer stations. A baby sitting service is also available on request. Constance Halaveli Maldives is an amorous resort which will make all honeymooners light headed with excitement. As the Indian Ocean surrounds you, guests realise they are hidden away in a tropical corner of the earth, which is mostly untouched. Such refined beauty is infectious and guests surrender to the serenity of Constance Halaveli Maldives. Privileged to be seeking refuge in a clandestine thatched roof villa, intimate moments can be shared at the sumptuously comfortable and indulgent stylish villas; nestle away in your exclusive paradise and be at peace. Natural tones and modern wood work flow through each villa and the interior touches are simply stunning. Dining at Constance Halaveli Madlives is a refined affair; each dish is served with intense rich flavours and a selection of the finest of wines. Befitting to Constance Halaveli Maldives is U Spa, a relaxing haven designed to caress your worries away on this ultimately alluring honeymoon island. Each serves beautiful dishes that are infused with flavours and spices that will take your breath away. Jing – Authentic Asian cuisine is fused with contemporary European flavours to create mouth watering delights. The magic intensifies as guests walk towards the stilted restaurant and become mesmerised with the endless views of the Indian Ocean. Beach Grill – Fresh seafood and fine cuts of meat are grilled perfectly. Tasty delights are served with zesty and refreshing flavours. Dine al fresco at any time of the day, enjoying tasty grilled treats as the sun sets in the distance.